Hello! I hope all is well. The weather has been gorgeous here in Northern New Jersey. The leaves are falling and there is a crisp breeze. Just enough to blow the leaves around for my boy Reeses to think he can catch and eat, LOL!!! Mama says no to that, it isn’t good for the belly. For three years he has been trying and for three years Mama has said no. Now for the post, I know our home is far from being finished, but when I saw these items on Décor Steals I had to make a move. I knew that if I didn’t buy these for the new house when I saw them I may not be able to get them again. I am so excited to share the items I purchased. I knew when I saw this, I wanted it to be a statement in our kitchen. I jumped fast and I couldn’t wait to see it in person; it did not disappoint. My girlfriend Audrey wanted to purchase a gift for us and wanted it to be something that we would really appreciate. She decided this was perfect, so she generously said that this was her gift to us. Now everyone that comes in our new home and every time I look at this beauty I will know it is from her. This next piece I loved when I saw it! 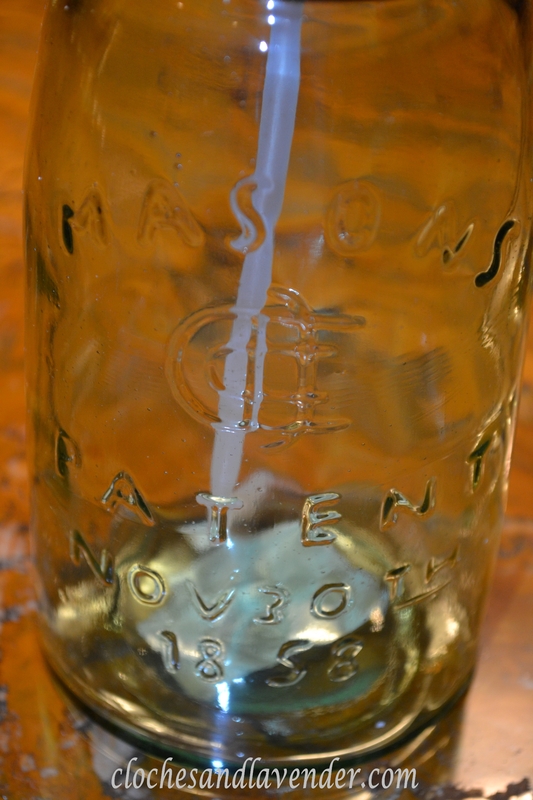 A mason jar soap dispenser for our kitchen. How great is this piece I ask you? In our other home we had the built-in soap pump. From experience we knew we didn’t want to go that route again. Ours for some reason would always break, it never would pump correctly. I think we went through three Price Pfister pumps. Good thing my blog is so small they will never know the difference or they would not want to be my friend for mentioning this, LOL!!! The next piece I saw was this olive bucket. When I saw this at Miss Mustard Seed when I started blogging, I knew I was going to get one. I researched them online and as many of you already know, they can cost $100 or more. I didn’t really want to spend that, so, when I saw this baby on Décor Steals I knew I was grabbing it, only $50! I can’t wait to incorporate them in our new home, I am getting so excited!!! Thanks Des for always stopping by. I knew as soon as I saw them I wanted to incorporate them in the new house! Nice Finds!! I love the cow head….I told my husband that I was toying with the idea of a white ceramic deer head above our stove….ahhhh….he isn’t quite so sure about that one ~ lol!! Have fun shopping for the new house! Thanks so much. I am a lucky girl my husband doesn’t really care what I do in our home. We have very similar tastes. I just think if I see something I really want for the house and know there is a chance I can’t get it, snap it right up! Thanks Susan, when I see something that I know I really want I am grabbing it especially from there. Great prices!!! What wonderful pieces! They will look great in your home. Thanks so much Lynn. It is a pain with those soap pumps. I don’t understand why they seem to do that. They aren’t cheap either!!! Yes I did and I am so happy I grabbed them. I can’t wait until they start framing. We really want it to move along. Cynthia, I do the same thing. Pick up things that I love when I find them. Sometimes it’s at hubbies dismay. lol! But, he sure was happy when I already had almost everything to decorate our basement when we finished it. I too bought the soap dispensers. One is in my farmhouse kitchen and the other the basement bath. I missed out on the Olive buckets and will be waiting for them to be repeated. I saw one at an antique store and it was $125. One of my favorite things from décor steals is my seltzer bottle. Keep shopping and can’t wait till they are in your new home! Thanks Jann, I am only buying items that I really, really want when I see them. You can’t beat some of the prices for items I see on Décor Steals!!! 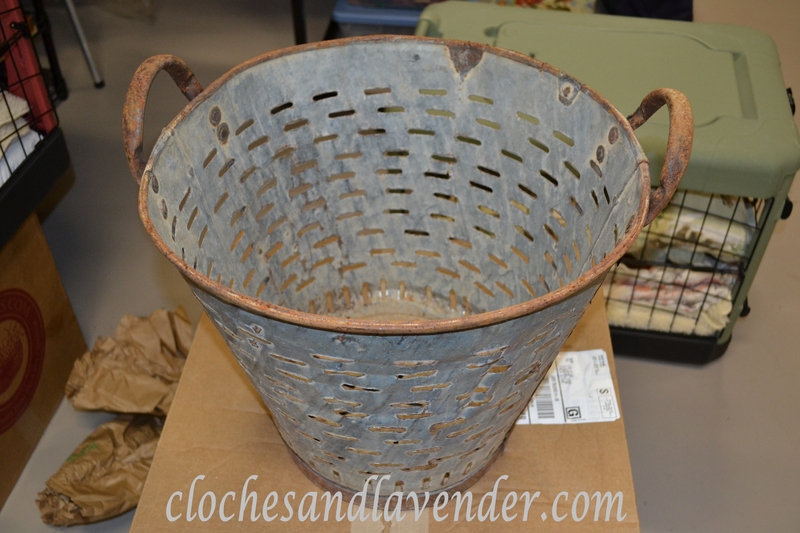 I saw Olive buckets for more then that online too!!! You have some fun items for your new home! I can’t wait to see them there. Great finds. I love that olive bucket. Thanks so much! I would love for you to follow Cloches and Lavender!!! Thanks so much Vickie. I am only purchasing items that I know I want as an addition! So happy for the visit. Oh I just LOVE everything you got! I love buying from Décor Steals because I love the farmhouse style that they offer. You found some wonderful pieces. I think they will give lots of charm to your new home. Thank you so much Kelly and thank you for always stopping by for a visit!! They do have fabulous prices!!! Isn’t that the most fun – gathering new pieces for a new home? I can’t wait to see them in the space! I am making sure I purchase items that I really want for the space and trying to remember about all our other items that are packed too!! Great finds Cynthia….they are going to look great in your home! I am trying to be very cautious about what I am purchasing. I have to remember all the items I packed, LOL. John wouldn’t be happy if he had to get another unit. Thanks for always stopping by! I love all your new finds for your new home. I’ve been seeing those olive buckets now on lots of blogs. One had a olive tree in it, loved it. Can’t wait to see how you’ll display them in your new house. I saw that it is coming along nicely. It will be exciting to see every week the progress, thanks for sharing. Thanks so much Jody for always stopping by. I am so excited with these new items. We are hoping they start to frame next week. Oh my gosh! I love love all 3 things!!! So much fun gathering things for your new house. It is so much fun but I am being very careful not to get to ahead of myself. I have to remember all the things I packed, LOL! All of the items are great! Have fun filling your home with things you love! Thanks so much. I hope you will follow Cloches and Lavender. I am glad I discovered you blog! I know what you mean about the soap dispenser! I thought it was me!! Lol. If you’re in northern jersey, we should get together. We’re probably no more than 45 minutes apart. Doreen that would be fun. The only problem is that I am not allowed to drive anymore due to my MS. It is not safe for me or others. I can’ react fast enough with my right leg. I walk with a cane but my trainer is hoping in time to get me off that, from her lips to Gods ears. I would love to meet you!! Oh wow you have every right to be excited!!! Those are wonderfully fabulous items from Decor Steals! I have that same cow head and I love it!!! 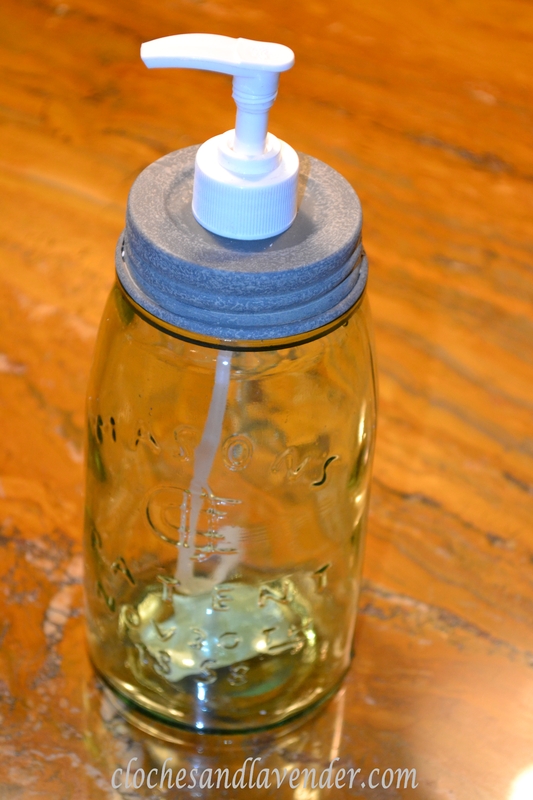 The mason jar soap dispenser and bucket will fit right in to your new home, can’t wait to see it all put together!!! Teresa thanks so much for your visit. I am being very selective with what I purchase. Hope you follow along!!! Cynthia, You bought some great things and that was a great deal on the olive bucket. Have fun with your new goodies!! Thanks so much, I can’t wait!!! I love the French statement your bovine makes! I just peeked at your last post too, and anyone who has ever had a house built knows what a big deal it is when you have your footings! Congratulations! Nice to see the place take shape. Love your new olive bucket too. A great price. We must be members of the club now! haha! LOL!! Thanks so much for stopping by. I hope you will continue to follow the progress!! What great, fun, new items for your home, Cynthia! 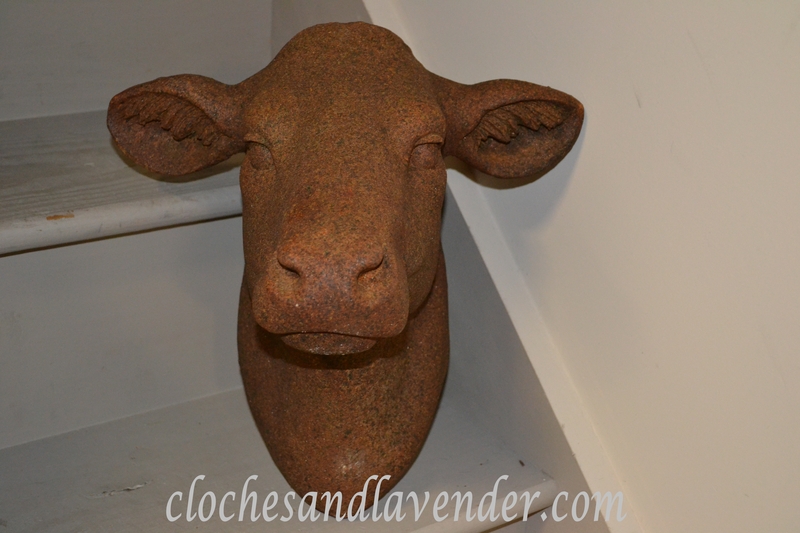 The cow head is going to be great and make such a statement in your place. I need to check out those deals. Thank you for sharing. Thanks so much for the visit Kitty. I love the items I purchased and that cow head is so much prettier in person. I can’t wait to used them. You should really check them out some great stuff! What a great haul, I love every single piece. Thanks so much. I can’t wait to use them!!! what a great gift from your friend and finds for the the new home. I love that olive bucket. I have never bought from this store but kinda tired of sitting back watching everyone else’s goodies!! What will you name the cow? I would check it out. I don’t know what I will name it, hmmmmm just gave me something to think about! I love the cow head and the olive bucket too. $50 is reasonable and much better looking that the Walmart one. Thanks so much Miss So Creative, Carlene!!! These are some great choices for your new home! I know it’s fun being able to collect some favorites ahead of time and envision them in your new home. Thanks so much Mary Alice. I can’t wait to use them. Can’t go wrong with any of your fab finds! Thanks so much. I will be posting an update on the build this week! Those are all great! I almost got the cow head but decided on a deer head instead! I like that too. I knew that I wanted this for our kitchen! Thanks for your comments! Happiest of Thanksgivings to you and yours Cynthia! Thanks for being here always Stacy. Have a Happy Thanksgiving and blessings to you and your family and especially your mom!!! Melissa thanks so much. I can’t wait to use all of them but I can’t wait to hang that chow in my kitchen!!! Cynthia, I just wanted to make sure I wished you and your family, “A Happy Thanksgiving”!! Hope you’re doing well and staying warm…take care. Jody thank you so much. I hope you and your family have a fantastic Thanksgiving!!!! I am doing well and the house is “slowly” moving along!!! Well, hello again! So nice that you stopped by for a peep at my decorating! Happy Thanksgiving! Have a very Happy Thanksgiving!!!! I love your beautiful blog. I have been busy, sorry I haven’t posted a comment. Thanks for stopping by!!! It is looking great. It is looking more like a home. I bet you are excited to see it coming to life!!! I am so excited. It snowed here today so I don’t know what happens now. I will call the builder. I understand that you are very busy Kris. I am just excited, thanks for the time.